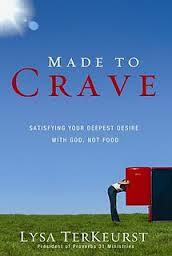 So this week I started an online bible study through the Proverbs 31 Ministry website, called “Made to Crave“, based on the book by the same name by Lysa TerKeurst. This isn’t your typical Bible Study. Nope, this one has challenged me from the first page. 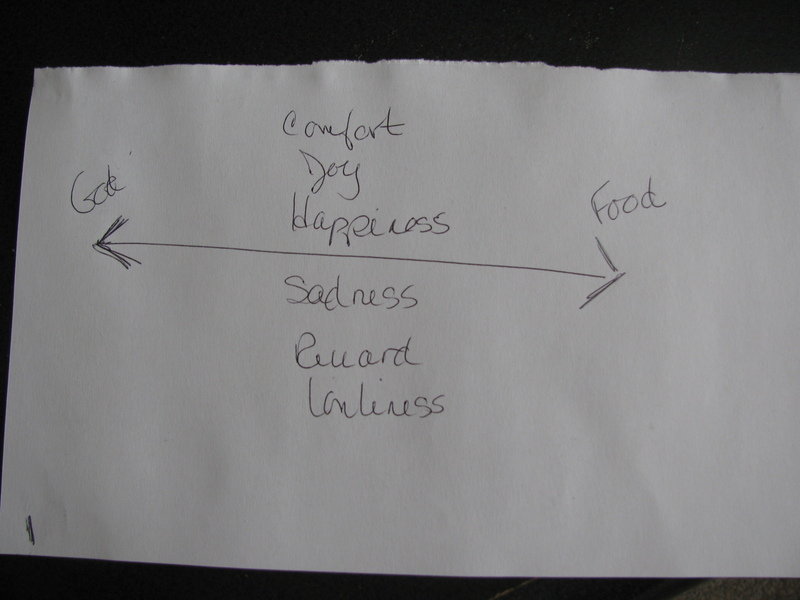 It has asked me to confront some of my deepest emotional triggers when it comes to my food issues. For example… the author asks “Is it possible that I love and rely on food more than I love and rely on God?” Yikes. Now that’s a loaded question for sure. When it comes to comfort, joy, happiness, sadness, reward, lonliness where on the spectrum do I turn? Do I rely more on food? Well, if the number on the scale represents anything… I would have to be honest and say yes. So this week it all comes down to me empowering myself in this journey to take a real look at what I do and why I do it. What is the reason for my behavior and my reliance on food to somehow make me complete… console me when I’m sad… celebrate with me when I’m happy… and be my ever present companion when I’m lonely. This week I am not going to concentrate on punishing myself when I make a wrong choice… rather I think, for me, that I will take the time to examine what it is that led me to that choice. I am going to ask God to reveal to me what is so special to me about my relationship with food that I am willing to put my health at risk to maintain that relationship… and while I’m at it… what would happen if food and I learned how to be just friends. Father God, You have given me free choice, and I choose to live a life in love and in service to You. But sometimes I don’t make the right choice, especially when it comes to the food and drink that I consume. So, today Lord, I am admitting that I am weak and I am asking that You would guide me when I make those choices. Your word says that when I am weak, You are strong… so Lord when I am weak and am about to make a choice that will cause harm to my body, nudge me to make a better choice to bring health and wholeness to my body. Your word also says that my body is a temple of the Holy Spirit, who through You is now in me. Help me to honor You with my body that it will be healthy and strong and a fit temple. Lord, when I am tempted, help me to remove myself from the temptation and make choices that will honor You. Help me to desire You more than I desire food. So Lord, help me to stand firm and be careful not to stumble and fall. Your word says that no temptation can seize me except what is common to man. But God, YOU are faithful, You will not let me be tempted beyond what I can bear. So when I am tempted, I ask that You provide a way out that so that I can stand up to that temptation. I am looking to You minute by minute – hour by hour – and day by day to walk beside me and help me to make the right decisions to bring my food addiction under complete control. Give me the wisdom to make the right food choices. So that I will desire to choose food that will nourish and bring health to my body and in turn, honor to You. Lord I thank You for hearing my plea and covering me in Your Grace. And I ask all of this through Your Son, Jesus. Amen. I have the feeling that this is going to be a long 6 weeks… and I am so looking forward to the journey. More to come in the next days and weeks…. It was humbling to answer that question. But honesty would require me to answer that yes, I do rely on food more than I rely on God. That is something I want God to change in me. I want Him to change it as I come to him in complete submission and give him permission to dig deep. I know if I try to do it on my own, I will be in the same place I am today over and over again. Loved it Ann, such great words of wisdom. It made me laugh when you said, “What would happen if food and I learned to be just friends.” Praying for continued revelation for you. II am a huge fan of this author and praise you for this review, well written.